There is a particular app for compare the products in google play store. “Versus” is the comparison app, it will help you to make informed decisions with everything from product purchases to city destinations. It can compare cameras, tablets, phones, CPUs, headphones, graphics cards, cities, sports watches, single speakers, PC and gaming headsets, camcorders, monitors, fitness trackers, game consoles, motherboards, TVs, universities, robotic vacuum cleaners, projectors, headsets, scanners, e-readers, MP3 players, resorts, tumble dryers. 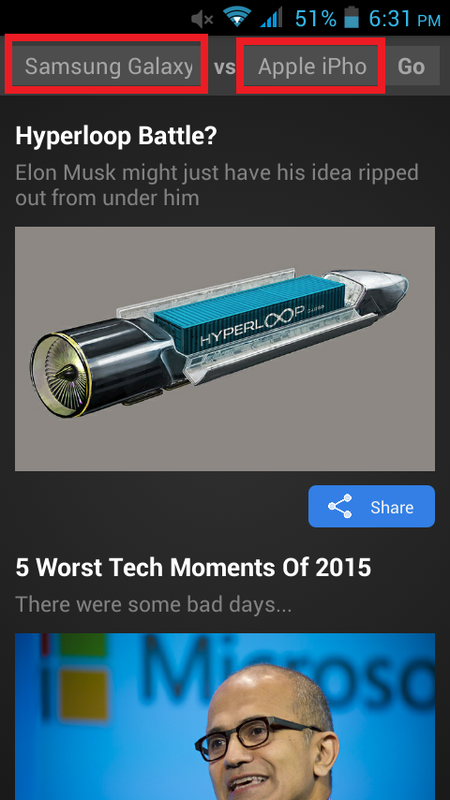 Not only this versus news is integrated into the app, offering the latest tech news. 2. Tap to open, in top there are to box, just type your product and tap on “go” slide right and left to see the results.